> News > Cover App is killing two birds with one stone! Imagine, it’s cold outside, the air is dry and your guts tell you it could start snowing anytime now. You’re enthusiastic, you put on your warm coat, run to the door and go outside. You’re catching a breath of fresh air, you’re enjoying natures’ beauty, but then start feeling there is something that just isn’t quite right. And then slowly it sinks in, you’ve forgotten to put on your gloves. Even though your body is covered well for almost 90%, you can only think about your cold hands. Sounds familiar? Well, this principle applies to badly insulated buildings as well. Maybe some thermal insulation has been applied, but certain parts left uncovered, or covered badly, simply create inefficiencies. The biggest pain point of classic thermal insulation has always been the windowsill. It was either subjected to invasive interventions, cuts in two included –aww! – or even completely skipped, with a thermal bridge and a dispersion of the precious warmth in winter as a consequence. 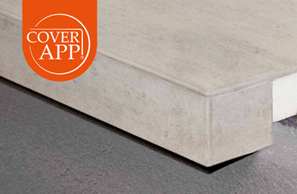 Cover app has replied to this problematic with an innovative product; the insulated windowsill. In technical terms the window sill exists of a polystyrene thermos-insulating support and a front panel in grès porcelain stoneware which is put on top of the old windowsill. And this is how Cover App is killing two birds with one stone; the owner of the building enjoys a beautifully refined windowsill, whilst the installation has been simplified significantly for the installer. 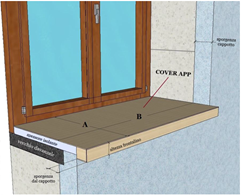 In addition to the comfortable installation without any demolitions, the insulated windowsill offers a wide range of other advantages for the owner of the building: these include savings on the energy bills, fiscal deductions up to 65% of the costs, an elegant solution thanks to the wide range of styles amongst which you can choose and obviously it puts an end to the dispersion of warmth. Did Cover app catch your attention as well? Are curious and would you like to know more about it? Write us on WhatsApp or if you are happy to leave your house – make sure to cover yourself properly, if it’s cold outside, though! – and pass by at the shop for some more information.